Get your kids in the Christmas spirit by reading this fresh take on the reindeer getting ready for the season at the North Pole. Ronaldo just wants to join the flying reindeer and has been training for months, getting stronger and eating Carrot Flakes every morning. His hero, Vixen, is one of the best flying reindeer and he wants to be just like him. 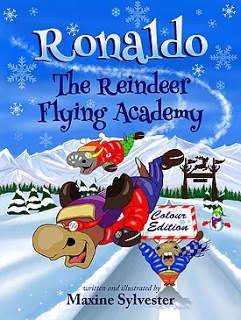 During the difficult endurance challenge, Ronaldo stays focused on his goal of being one of Santa’s elite reindeer and flying with Vixen. His body is so cold, his fur is stiff, and he can’t feel his tail. But he remembers his grandad’s advice, “Don’t just think it. IMAGINE!” So, he keeps flying and you’ll have to read to find out what happens to Ronaldo that leads to him meeting his idol Vixen. Youngsters will love all the witty remarks and fun that Ronaldo has with his best friend Rudi and how he conquers the bully, Dancer. I am sure there will be laughs when the kids read about Ronaldo taking a warm bath with fizzing bath bombs. This story offers kids a different perspective on the story of the North Pole that is cute and full of action. 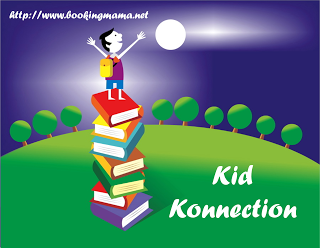 The chapters are short and kids will enjoy the illustrations throughout the chapters. This is the first in the series of three books about the Reindeer Flying Academy so kids can enjoy more of Ronaldo and his escapades. 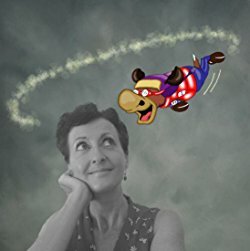 These books would be great for parents to read to younger elementary-aged kids or older, early chapter book readers can read it on their own. Ronaldo may inspire your child to work hard and follow their dreams….whatever they may be. Maxine’s love of ‘fun’ art grew and she had the privilege of being mentored by cartoonist and caricaturist, Steve Chadburn. She completed further studies in children’s book illustration with talented artist and illustrator, Jan Nesbitt. To see all of Sylvester’s books, click HERE. Visit her website, HERE. Thanks to the author for sending an eBook for the purpose of this review. This review is my honest opinion. If you choose to purchase the book through the above links, I may receive a small commission without you having to pay a cent more for your purchase. Thanks for supporting SincerelyStacie.com. I really do appreciate the time you took to do this and i am thrilled that you enjoyed it.